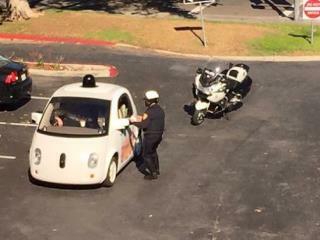 (Newser) – Apparently Google's self-driving cars have yet to learn how to evade cops. One of its bubble-shaped autonomous vehicles was pulled over during a traffic stop in Mountain View, Calif., on Thursday, though it managed to avoid a ticket, reports NBC News. An officer spotted the vehicle traveling 24mph in a 35mph zone, with traffic backed up behind it, police say, per the San Jose Mercury News. "The officer stopped the car and made contact with the operators to learn more about how the car was choosing speeds along certain roadways," authorities say in a blog post, noting "it was lawful for the car to be traveling on the street." I think I know what caused the car to drive under the speed limit. The google car goes by the same type of speed limit info that my own GPS goes by and often my GPS reads the speed limit of a road that contradicts signs posted on a road. So the google car has some A-HOLE software installed in it. How did it know to stop? In the future, can the cop just send an e-ticket? Will this wind up with a credit system like on, "5th element". When the car reaches zero credits, will it have to quickly return to home base?